You can configure your Zendesk Support instance to be open, closed, or restricted (see Configuring how end-users access and sign-in). This article describes how to set up a restricted Zendesk Support instance, so you can control end-user access through approved email domains. This means that your Help Center is visible to all users, but only users with email addresses in domains that you approve can register and submit support requests. Any unapproved user’s support request will be either be completely rejected or sent to the Suspended Tickets queue. In a restricted Zendesk Support instance you enable the option to allow anyone to submit tickets and then use the whitelist and blacklist to accept or reject those requests. Select the Anybody can submit tickets option. Optionally, in the User welcome email section, select the Also send a verification email when a new user is created by an agent or administrator option. This option is explained in more detail in About new user email address verification and passwords below so you can decide if you want to enable it. Note: If you started using Zendesk Support on or after August 21, 2013, this option is not available until you enable Guide. See Getting started with Guide. The next step is to decide if you want your users to register. When you enable the Anyone can submit tickets option, you can also require your users to register. Requiring registration means that your users must create an account in your Zendesk Support instance, verify their email address, and also create a password. The password is required if they want to sign in to your Help Center to submit support requests, use the parts of your knowledge base that have been restricted to logged-in users only, or to track their support requests. Until their email has been verified, their support requests remain in limbo (in other words, not added to your views and agents cannot work on them). You want your users to verify their own email addresses so that you ensure they are who they say they are. Note: If you started using Zendesk Support after August 20, 2013, this option is not available until you activate your Help Center. See Getting started with Help Center. Select the Ask users to register option, which is displayed when you select the Anyone can submit tickets option. If you don't require registration, your users still have the option of registering themselves. The Sign Up page link is still shown in your Help Center. This just means that registration is optional and that the support requests you receive are immediately added to your Zendesk. Tickets are not held up waiting for the user to verify their email address and complete the registration process. As mentioned above, if you do require your users to register, any support requests they submit are held in limbo until they have verified the email address they used to sign up. Unverified users are also unable to sign in since they cannot create a password until they have verified their email address. The Also send a verification email when a new user is created by an agent or administrator option merely sends the same verification email that users receive when they sign themselves up for Zendesk Support. If you add users yourself and you require your users to register you'll probably want to enable this setting. The user will receive the verification email and then be prompted to verify their email address and choose a password so that their support requests are received in your Zendesk Support and they can sign in to your Help Center. These actions result in the verification email being sent to the user who can then verify their email address and create a password. Several other options are available to agents and admins. Both can manually verify a user's email address (See Verifying a user's email address in the Zendesk Agent Guide). Of course doing this doesn't also create a password for the user, but if they don't need to sign in to your Help Center (if you're providing email only support for example) this allows them to submit tickets. Admins also have the option of setting a user's password. This is a password security setting and should be enabled only after you've considered the security implications. It's always best for only the user to create their own password. For more information, see Setting the password security level. When you select the Anyone can submit tickets option a number of other options are displayed. In addition to the Require users to register option, you'll also see the Whitelist and Blacklist. You use these to specify the email domains that are either allowed to or prevented from registering and submitting support requests. "Users with the email address username@domain.com are not allowed to sign up for this help desk"
In the Whitelist field, add one or more email domains. These are the domains that you are allowing to register and submit tickets. 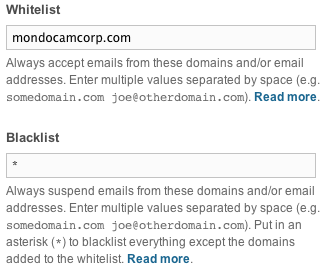 In the Blacklist field, enter an asterisk (*) to block all other users. You can also enter specific email domains or email addresses. suspend - The suspend keyword explicitly declares that a specific domain or email address will be sent to the suspended tickets queue. This is identical to blacklisting the domain or email address without a keyword. reject - The reject keyword completely rejects the email, which means that it's not added to the suspended tickets queue. All three keywords can be used together to define your rules. For more information about using the whitelist and blacklist, see Using the whitelist and blacklist to control access to Zendesk Support.